Book Pimping One Review at a Time: The Best Autograph Evah. 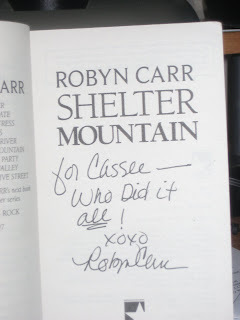 I think the highlight of the Dallas trip was my autograph by Robyn Carr. I've only been to two Literacy signings, but I walk around with the same person. 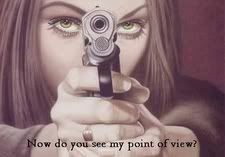 Basically I point, she buys. It's a system that works out very well for both of us. So we get to Robyn Carr's table and my friend whips out an amazon.com packing slip that came with the copy of Virgin River I had sent her. Robyn "awwwwed", so I started pumping her for information on what she has planned for Virgin River. Hey, never say that I don't take full advantage of an opportunity that's dropped in my lap. She tells us that her Grace Valley trilogy is going back into print because of how wildly popular the Virgin River series was. My friend made my love her even more (you know who you are) by telling Robyn that it's all thanks to me. Why? Because once I like a book and/or author, I'm like a dog w/ a bone. If you won't read it, I'll send it to you. I'll badger you. I'll cajole you. Maybe even threaten you. The end result? You'll read it. You'll love it. And I get that warm mushy feeling inside that someone loves a book as much as I do. Without futher ado, here's my autograph. Those who know me know how I am when my name is spelled wrong. In this case, I don't even care! I don't like you very much right now. Where's my signed copy?